If you’re in the beautiful north-east of Victoria in Autumn , you’re in for a leafy treat. Mid to late April is when the leaves start to turn and show off their impressive red and golden hues. To add to the gorgeousness you absolutely must turn off-the-beaten-track and head 8km from Beechworth to the rolling hills of Stanley. In this impossibly beautiful hamlet you’ll discover the Europa Gully Orchard, located at 22 Chambeyron Road Stanley. 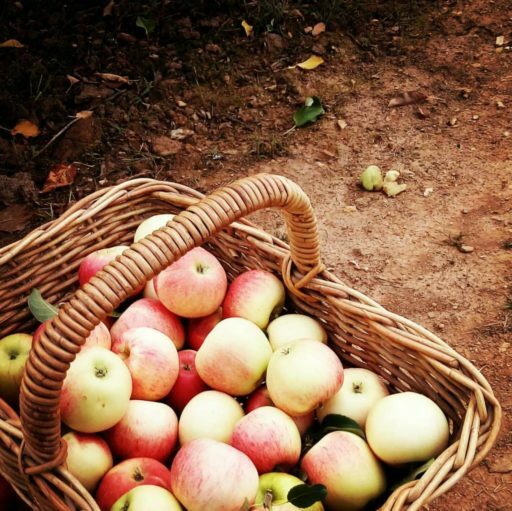 Here you can pick the freshest apples – to your heart’s and tummy’s delight. The very clever and committed Charlie and Jade Showers from Black Barn Farm, have opened up the vineyard for pick-your-own farm sales of heritage varieties including long forgotten names like Mutsu, King Cole and Five Crown. All the apples are grown without the use of synthetic fertilisers, insecticides or herbicides. After filling your hearts with the pure goodness of farm fresh, hand picked apples, head to the ‘Dough Bros’ stand and order yourself the best apple cider doughnuts in Australia. Delicious! Europe Gully Orchard is open every Saturday, 10am – 4pm plus everyday during the Victorian and NSW school holidays (6-28 April). They are closed Good Friday and Anzac Day.